AEB Interurban systems help the driver avoid a rear-end crash by warning and supporting adequate braking or ultimately stopping the vehicle by themselves. Car-to-car rear impacts are amongst the most frequent accidents on European roads. Typical crashes occur on the open road, at moderate to higher speeds, where a driver might be distracted and may fail to recognise that the traffic in front of him is stopped, coming to a halt or is driving at a lower speed. 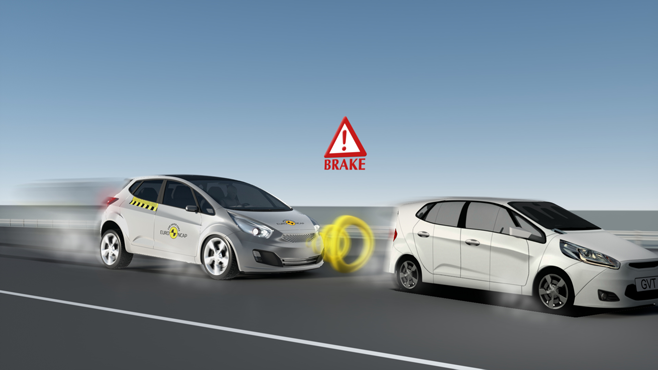 Car manufacturers offer avoidance technology that warns the driver of an impending collision, supports adequate braking and/or ultimately stops the vehicle by itself. 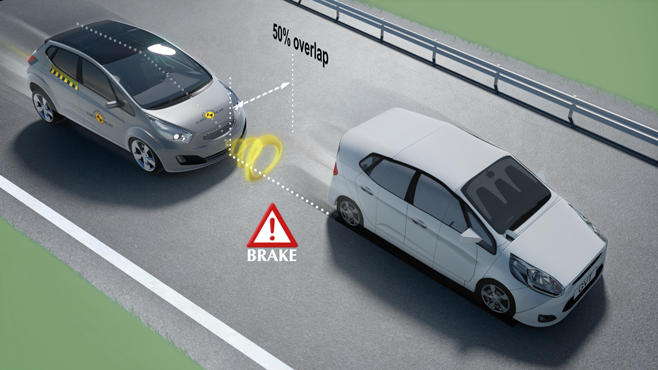 This technology is commonly referred to as Autonomous Emergency Braking at interurban speeds. For AEB Interurban systems, Euro NCAP evaluates the automatic brake function and the forward collision warning function in three different driving scenarios: driving towards a stationary vehicle (30-80 km/h), closing in at a slower vehicle in front (30-80 km/h) and following a car in front which suddenly starts braking (50 km/h, gentle and harsh braking). Two scenarios – stationary target vehicle and slower-moving target vehicle – are repeated for left and right offsets, where the centreline of the test vehicle is not in line with the centre of the target. As the sensors of the test vehicle can 'see' the side of the target in these offset tests, a specially-designed remote-controlled 3D target has been developed, known as the Global Vehicle Target (GVT). A high score is awarded to systems that are able to avoid a collision in all test conditions, or are able to significantly reduce the severity of the crash. It should be noted however that AEB is a support system that should not be overly relied upon by the driver. In more challenging situations, AEB activation may not be sufficient or not timely enough to avoid a crash completely, although the resulting impact speed may be significantly reduced. Good occupant protection remains vital to avoid serious consequences. Introduced in 2014, updated in 2018.